Note: Two product names have changed: SkyDrive is now OneDrive, and SkyDrive Pro is now OneDrive for Business. Read more about this change at From SkyDrive to OneDrive. 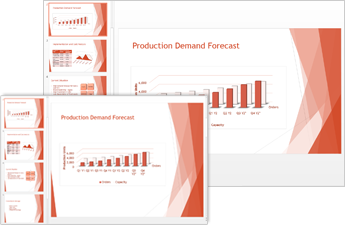 Microsoft PowerPoint 2013 has a brand-new look: It’s cleaner and primed for use on tablets and phones, so you can swipe and tap your way through presentations. Presenter View automatically adapts to your projection set-up, and you can even use it on a single monitor. Themes now come with variations, which make it simpler to hone in on the look you want. And when you’re working with others, you can add comments to ask questions and get feedback. To find out more about Office 2013, see What’s new in Office 2013. 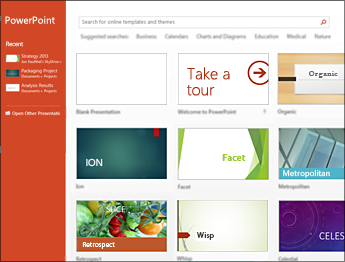 To learn more about what’s new with PowerPoint 2013, see the training course Make the switch to PowerPoint 2013. Office Mix is a new, free solution for PowerPoint that makes it easy to create and share online, interactive presentations, or “mixes”. Mixes play like web videos, but with support for animations, live links, and more. To get Office Mix, download and install the free add-in. When you open PowerPoint 2013, you'll see the new Mix tab. You can record audio or video speaker notes for each slide in your presentation. You can insert quizzes, curated videos, and more. Easily record what’s on your screen, while you annotate with audio. When you’re done, preview your mix, then upload it to OfficeMix.com to share. The OfficeMix.com portal offers analytics so you can see audience statistics and quiz results. Much of the world’s TVs and video have gone to widescreen and HD formats, and so has PowerPoint. There’s a 16:9 layout, and new themes designed to take advantage of widescreen possibilities. Now you’ve got several ways to share a PowerPoint presentation over the Web. You can send out a link to the slides, or start a full-on Lync meeting that displays the deck with audio and IM. Your audience can join you from anywhere, on any device using Lync or the Office Presentation Service. Themes now come with a set of variations, like different color palettes and font families. 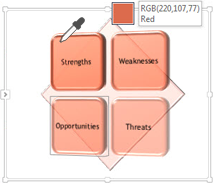 And, PowerPoint 2013 provides new widescreen themes along with standard sizes. Choose a theme and variant from the start screen or from the Design tab. Now when you create a motion path, PowerPoint shows you where your object will end up. 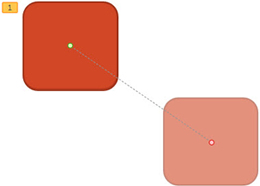 Your original object stays put, and a “ghost” image moves along the path to the endpoint. Select two or more common shapes on your slide and combine them to create new shapes and icons. 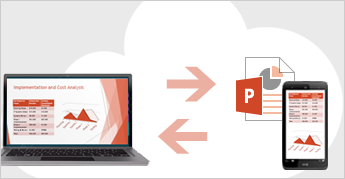 PowerPoint now supports more multimedia formats, such as .mp4 and .mov with H.264 video and Advanced Audio Coding (AAC) audio, and more high-definition content. PowerPoint 2013 includes more built-in codecs so you don’t have to install them for certain file formats to work. Use the Play in Background feature to play music while people view your slide show. You can capture the exact color from an object on your screen, and then apply it to any shape. The eyedropper does the match-up work for you. 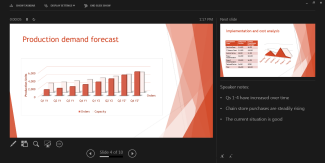 Now it’s possible to interact with PowerPoint on most any device including a Windows 8 PC. Using typical touch gestures, you can swipe, tap, scroll, zoom, and pan your way through your slides, and really feel the presentation. The cloud is like file storage in the sky. You can get to it anytime you’re online. Now it’s easy to save your Office files to your own OneDrive or to your organization’s site. 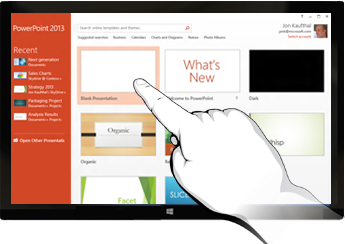 From there you can access and share your PowerPoint presentations and other Office files. You can even work together with your colleagues on the same file at the same time. 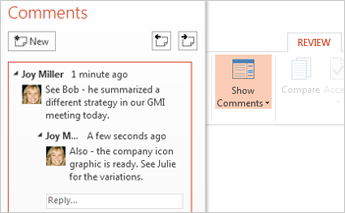 Now you can give feedback in PowerPoint with the new Comments pane. And you can show or hide comments and revisions. You and your colleagues can work together on the same presentation, either with the desktop or online versions of PowerPoint, and see each other’s changes.